Oats.......full of dietary fiber, which lowers bad cholesterol,reduces the risks of asthma, improves immunity, helps you cut the use of laxatives, and controls blood pressure. Broken Matta Brown rice.............., possesses an unique taste and flavor! This rice variety is grown specially in the regions of Kerala. Best source of magnesium, reduces risk of heart diseases, keeps the important blood vessels clear of clogs and blocks, decreases diabetes, enough and more of dietary fiber, controls blood sugar, great source of calcium, and keeps Osteoporosis at check. Just as Smart Phones have become a necessity in life, so are these millets, possessing Smart Carbs. Combine these three wonder ingredients to make this extremely tasty and healthy steamed dumplings!!!!! Brown rice and millet give a nice body and shape to the Kozhukkattais / dumplings...otherwise, if you make just with oats, the end product will sag and will not remain firm. so, probably, we can name these dumplings "Trimurthy"....like Brahma, Shiva and Vishnu, these dumplings too have the three ingredients, which are a must for us. Below picture shows the coconut oil heated up in a pan, seasonings done, measured water poured, then soaked dhal, grated carrots and grated coconut are added. 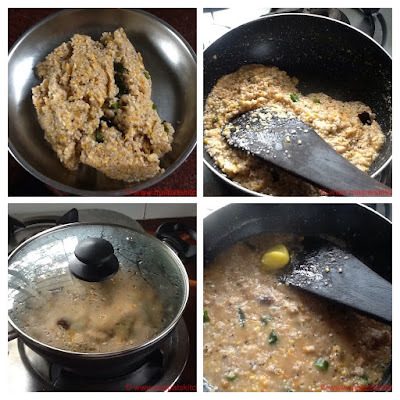 Then brown broken matta rice, millets and the pulsed, roasted oats and mixed well. Salt to be added, when things are 3/4 cooked. Cooked for 15 minutes....Can you see the fluffiness of the kozhukkattais??? Not to be disturbed till they cool down. Otherwise, they might break. Serve with Vedikka vitta more kuzhambu and a cup of curds!!! *In case you are having guests, and just want to steam the kozhukkattais when they come, all the earlier mentioned things can be done, and the shaped dumplings can be refrigerated in an airtight container. Take it out before 10 minutes, and steam them for 15 minutes, and stun your guests with these wonderful, super-nutritional Kozhukkattais!!! So healthy and looks delicious as always. Thank you Malpatskitchen for helping us eat better. Thank you Shilpa, your encouraging comments surely will make me prepare many more healthy dishes! Have some of these ingredients at home. Will head out to the Indian mart to buy the seasonings. Can't wait to try this recipe. Thanks Hannah. I am sure, you will like it.